During the same session at which we figured out how to translate joystick movements into motor signals for a robot with two drive wheels (https://coderdojoathenry.org/2019/02/24/hackers-how-to-control-a-robots-wheel-motors-based-on-joystick-movements/), we moved on to figuring out how to control the motor so as to steer an autonomous robot towards an object of interest. Again, we did a bunch of calculations on a whiteboard (see end of post), and I have re-drawn them for this post. Our solution is to treat this as a variant of what we previously worked out before, where we had a joystick input, where the X direction of the joystick controls forward movement and its Y direction controls whether to move left or right. In this case, we are steering left/right while always moving forward. Therefore, X has a fixed value (X=1) and Y is a value that depends on the direction of the object of interest. Constrained means: if the calculated value is less than -1, set it to -1; if it is greater than +1, set it to +1. At our most recent session in the Hackers group in CoderDojo Athenry, we spent out time on practical mathematics, figuring out how, if we want to make a robot that is controlled by a person with a joystick, how exactly do we translate movements of the joystick to signals sent to the motors. Our approach was to think about what joystick positions (X and Y) should result in what robot movements (M1 and M2), and then see if we could come up a way of expressing M1 and M2 in terms of X and Y. We filled a whiteboard with satisfying diagrams and calculations; see the bottom of this post. I have re-dawn them for clarity below. Each motor needs two control signals in the range 0-255, one for forward and one for reverse, so we will need more code to convert our M1 and M2 to what is needed for the H-bridge, but that is a fairly easy job for a different day. Good to see everyone there on Saturday. 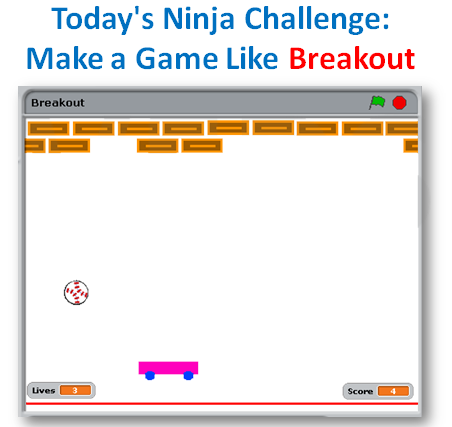 We finished our game from the previous week, similar to on old game called Breakout. 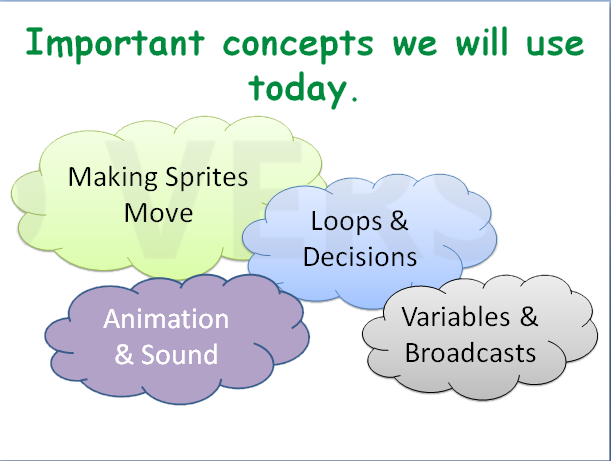 We used a number of important coding concepts again this week, loops and decisions, Variables, broadcasting, etc. Don’t forget we are off for the next two weeks. Enjoy the Break! I was away this week so Dave led the group, they did a couple of Arduino projects. They revisited the traffic lights from December but this time used the Arduino to control them and then moved on to a temperature and humidity sensor called the DHT11. Here is the wiring diagram for the traffic lights and you can find the code here. Here is the wiring diagram for the DHT11 and the code is also on Dropbox here. We will be doing more with the Arduino particularly for some of our projects. Creators – Shootah Part 3 – Enemies etc. In Part 2, we made a new bullet every time the user pressed the Up key and put it in the bullets list. This meant that after a while we could have a lot of bullets, most off the top of the screen, which was even slowing some machines down. In sketch.js, we moved the lines of code in the draw() function responsible for moving and drawing the bullets into a new function called manageBullets() and called it from draw(). In manageBullets() we made a new list called active and put every bullet that was still active into it. We then made this the new bullets list. We write a little code that printed out the total number of bullets to verify this was working. We added a new file called enemy.js and included it in the index.html file. This file looked a lot like player.js. The main different was the move() function. Our enemy moves constantly left-to-right. When it gets too far off the right-hand side of the screen (checked in move()) we set its x position to be off the left-hand side of the screen instead. This makes it loop around. We’ve done two and we’ll do some of the others for sure.